Match made in Seven: Punk! 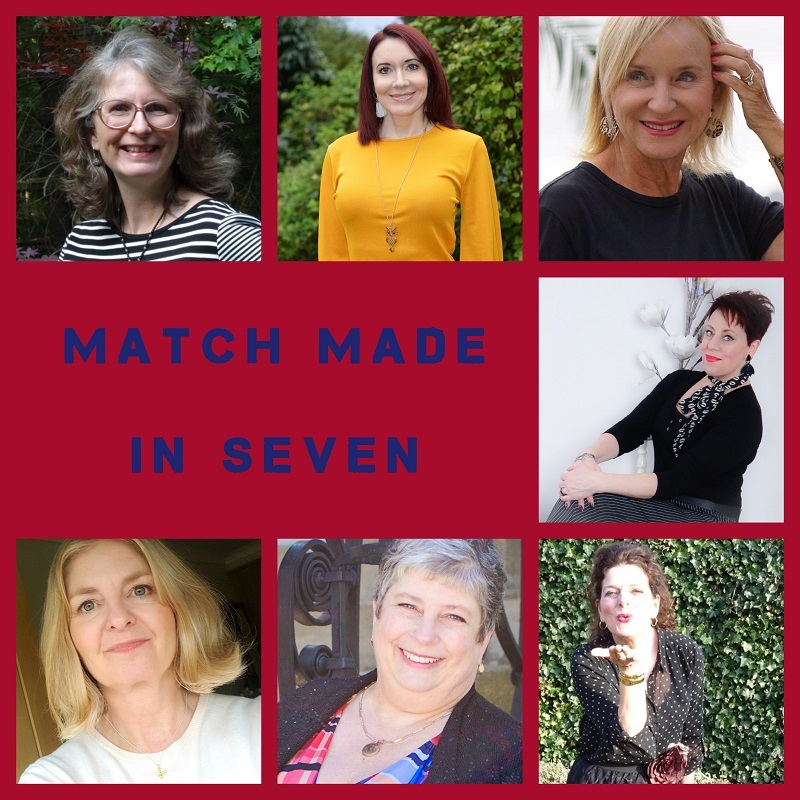 This is the premiere of Match made in Seven with the theme: Punk! We are a international group of seven fashion bloggers who meet once a month. One of us chooses a theme in turn, and that can be anything. A book, music, a color, a movie. And then we style an outfit based on that theme. We hope you enjoy it! The theme of this month is chosen by me. I chose this outfit because it reminds me a lot of when I was 16 and was indeed punk. We are now 35 years later, I have changed my punk outfit a bit. I mean, then I had soap in my hair to keep it upright and holes in my fishnet tights. Don’t do that anymore! Lol. But of course it has to be with a lot of black. And because I was already a fan of Vivienne Westwood, and wore a lot of checkered skirts, I now do it again. Such a shame that I can not show you a photo from that time. I remember well when I first came into contact with punk. I was in a conservative high school and while everyone was crazy about Grease, I thought that was really awful and I loved hard rock more. And when I was on holiday in England, Cheddar, I saw a group of punks there. I was so introverted by their clothing that afterwards I started to dress more punk. Sometimes I still do. Fortunately, I went to a free school soon, I was kicked of the conservative one, where you could be totally yourself. I am wearing a black knitted cable sweater because it remind me of the self knitted sweater I wore a lot back then. A lacquer belt and chelsea boots, because lacquer is punky. A checkered skirt over a tulle skirt and of course a safety pin! I am not wearing fishnet tights because I want the attention on the skirts and the pin. And I want to wear a elegant punk look! And now pop over to these fabulous ladies, and see how they interpeted the punk theme! I LOVE this interpretation of punk, Nancy! It definitely reads Westwood (with a touch of McQueen). 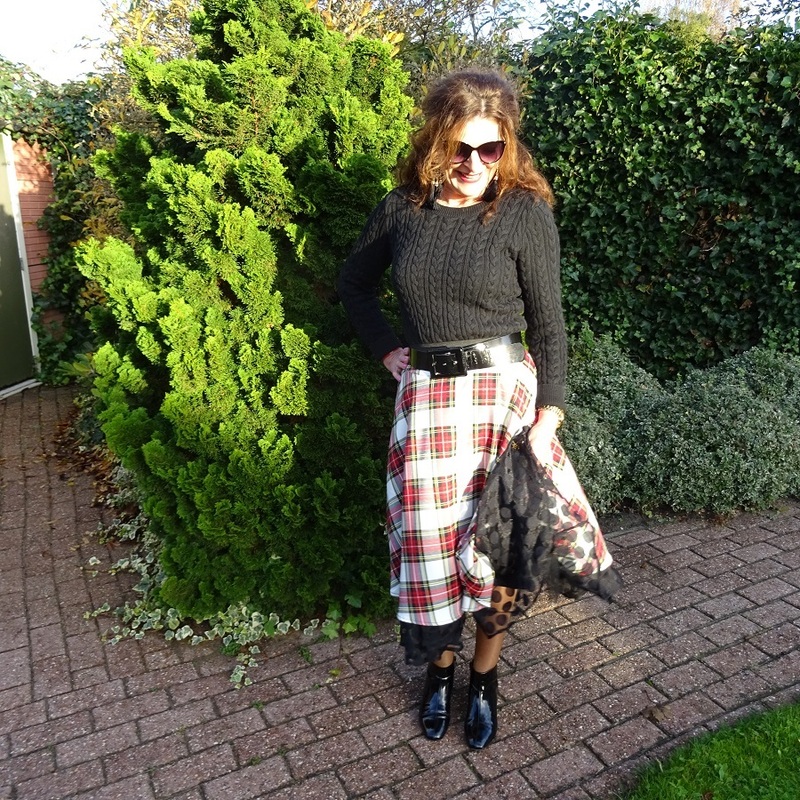 I am going to steal the idea of pinning up the underskirt – love that! Not with your tiger pin Sheila! Really can’t stand seeing it! If you were my neighbour I would steel it from you! Hahaha. So cute!!! I wish you had a throwback picture—I love your flashback fashion inspo story! Oh my gosh, I’m dying to see the picture of Young You all punked out!!! You look great, Nancy! 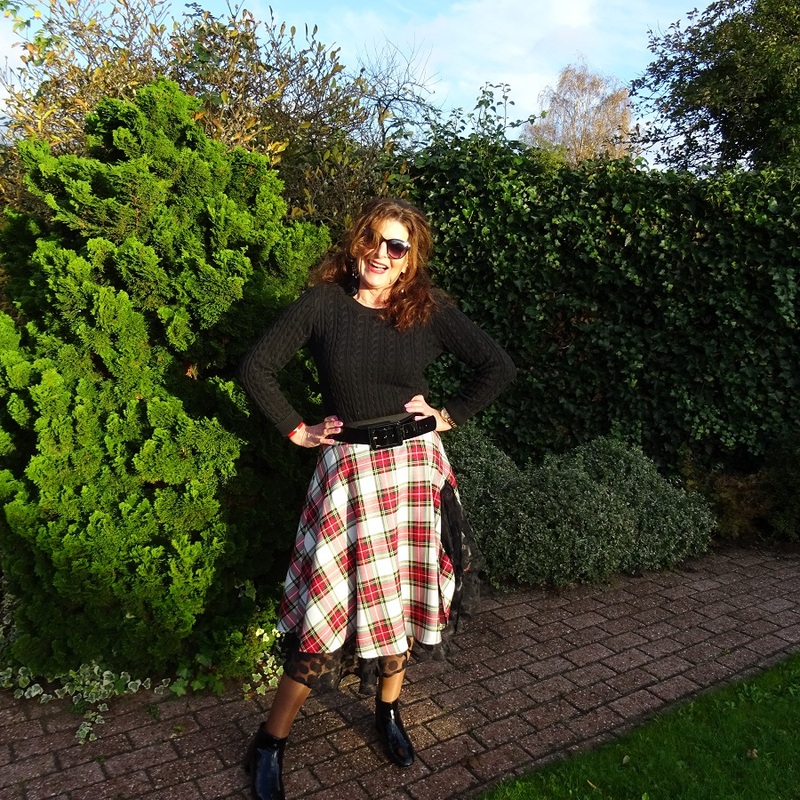 I think I’ve loved this plaid skirt before, with the pinned-up petticoat, brilliant! I just remember that I perhaps might have a photo of me back then on FB. I will check it. Yes on my, not seeable blog anymore! Yes! Love your look! 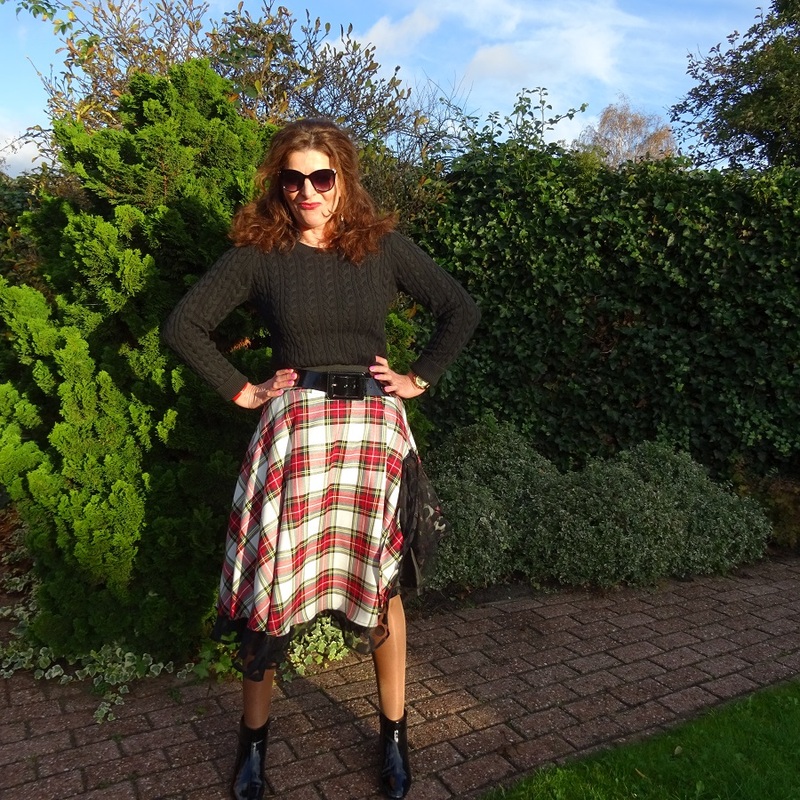 It is like Vivian Westwood with a little bit Gothic Punk! I could wear this too, it is stylish! It’s wearable! What a fun series right! I love your skirt Nancy! What a great idea to wear it over a tulle skirt and add the safety pin brooch! 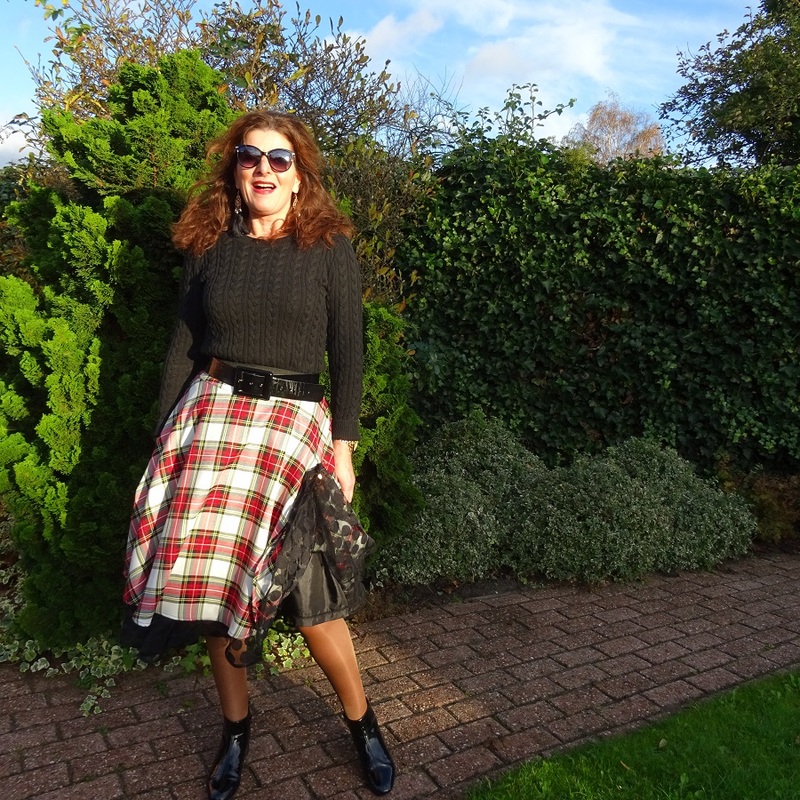 I was looking for a tartan mini skirt for this theme but couldn’t find one, but I’ll still keep looking because I love a bit of punk style! It is fun isn’t it! 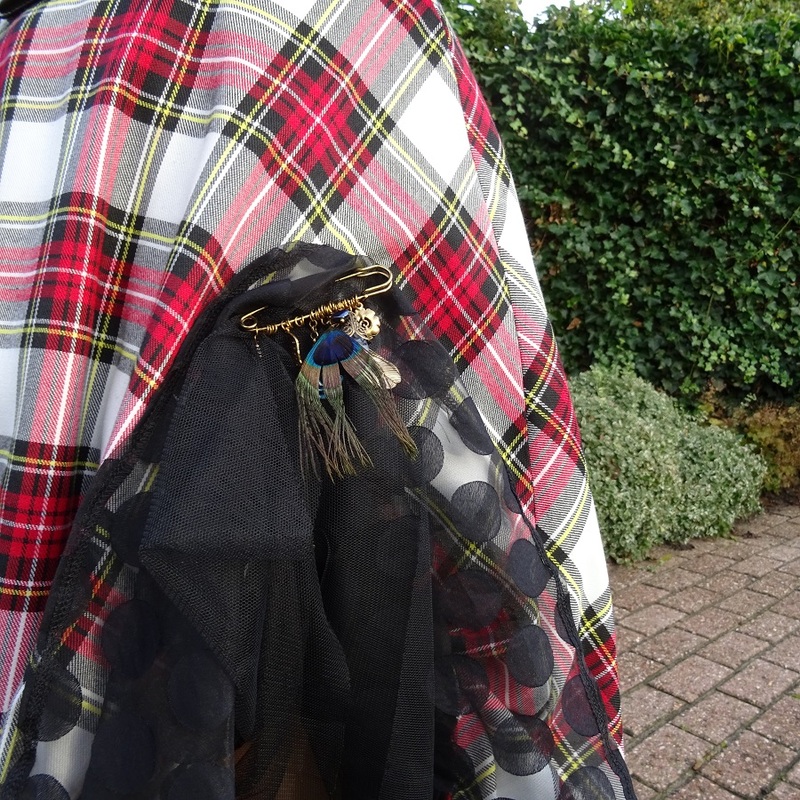 I would like to have a tartan blue green mini skirt with a safety pin. I am going to search for it in February in the uk! Thank you very much Mica! What a fun theme! 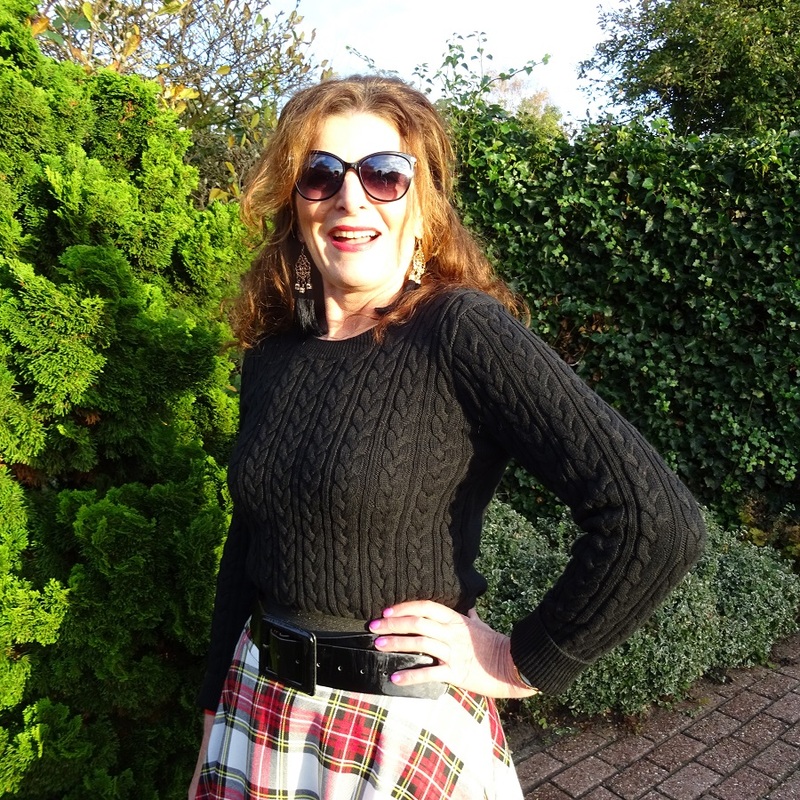 Love the skirt, reminds me of Cyndi Lauper, whom I loved back in the day (still do) and wanted to dress just like! Ah yes Cyndi Lauper. That as a decade later! Haha. Woow! I haven’t got words for your skirt! It’s great!! This is such a great way to showcase punk, Nancy!! It’s a little edgy yet still something you’d see normally!! Yes, we stayed ourselves! Thanks Jodie! Love your punk style, Nancy! Thanks so much for putting our Match Made in Seven together. And for choosing punk as our first theme. It’s been so much fun this month!! Yes it was! And I love having you with us! I love that name, Match Made in Seven! You nailed this punk look, very Vivienne Westwood! What a FAB look, Nancy!! Your interpretation of punk is pure genius. LOVE the skirt! Thank you Suzy! How is your book going? Love that safety pin brooch and yes, you def. styled punk to its greatest here! I knew it! Did you love Siouxie and the Banshees too? Totally relatable Nancy and I adore the skirt. Inspirational to have plaid and lace. I wasn’t a punk so was interested in you saying you soaped up your hair. Sugar worked too according to my husband. Sugared water. Haha, really? Never tried that one! Was he a punk too then? I love your interpretation—you totally channeled the 80s!! Hahaha, that is a fun one! Thanks Darlene, it was fabulous to see how you all made such a effort! I’m really enjoying this! I appreciate your creativity in coming up with the name for this series. I’m impressed by the outcome of your group interpreting the theme for themselves. Each of you used what you have and incorporated it into a punk styling that looks modern and like your true selves. Haha! Thank you very much! I loved it so much that everyone took a effort to make this theme their own! It’s lovely of you to say so! Ah i too was a bit of a rebel in high school and college I was a goth. You should post some pix of your self from back then. That skirt is so fan and a great to bring back the past and look fashion forward. I don’t have any photos from that time! I wish I had! Thanks love! The skirt is so amazing, what a lovely look my dear.